Small Town Big Sound started off with a dream: Keegan Paluso’s desire to use his musical background to help others in West Tennessee realize their potential. What began as this idea soon formed into a community of local artists, each with different and diverse experiences, working together to create original music. Keegan shared with me about how Small Town Big Sound writes, records, and produces the music of our area. You and your team wrote and recorded an entire album in one week. Why set a time limit of one week? That’s really interesting to me. It essentially was all we could afford. It started off [with] the first album, Volume I, that’s on Bandcamp. It was really just an experiment to see what we could do, and it forced creative environment. A lot of people like to wait around for creativity to strike; they think it has to be kind of serendipitous. But a lot of the great musicians and composers that I’ve studied throughout the years need restrictions, they need challenges, in order for creativity to blossom. So the first year I just issued a challenge to see what we could do in that short amount of time. It ended up turning out to be something really, really awesome. And then, the first album we wrote, we wrote in three days and recorded it in two. And the second volume that we released, we actually wrote and recorded in five days. Putting a time limit on things forces your brain to get in gear. You’ve mentioned two volumes, but is there another one coming out soon? Our third album, we just finished tracking in June. We did twenty songs in five days, and we’re actually going to release two [parts]; we’re going to do a dual release. We’ll release ten songs, which will be Side A, in late October or early November, and then we’ll release the second ten in March or April. We’ve done away with the whole volume thing. It’s gonna be Small Town Big Sound 3: Side A and Side B. In regards to the time crunch and everything, what does the songwriting process look like? It depends on the song. Some artists will have a really good singer, and they’re just like, “Write me a song, I don’t care what it is.” And we’ll get together and collaborate and really find a song that fits best for their voice. . . . And then other people have a rough idea for a song coming in, and they’ll schedule a session with me and maybe one other person, and we’ll just do our best to make their song more theirs. We have one lady—she’s a music teacher in Jackson—and she just messaged me one day [that] she had a song. She showed up with her guitar . . . and we just helped her make her song more hers. We’re not trying to make it better or worse, we’re trying to make them realize their vision. So sometimes people come to you with work they’ve done in the past . . . ? They’ll come to us with ideas that aren’t totally fleshed out, and our job at that point is coming up with an arrangement. How have you found your team? Can you tell me some about where you’re from? There’s a big Northwest Tennessee emphasis in your music, as well as a celebration of local flavor. How did growing up in this area shape you? I was kind of a late bloomer in music. I didn’t start playing music until right before I started high school—I started playing drums. I joined marching band and fell in love with [it]; I learned how to read and write music and things of that nature. On the other side of that, I had a group of friends who would always jam in the garage. Every Thursday night was jam night! So I was learning how to shape music from two different sides. And when I went to college, I did the same thing. I was majoring in music, and I had to learn a really disciplined practice schedule . . . and then I started playing on the local music scene. Small Town Big Sound kind of came out of me seeing there were phenomenal working musicians in the local music scene, and there were phenomenal classically trained musicians that I was going to school with, and they needed to know about each other! Just getting them in the room together makes some incredible things happen. How did the studio come about? The studio was the lynchpin in the plan. There’s a gentleman—his name is Micah Barnes—from Union City, and he moved to Murfreesboro to run a recording studio there. Long story short, he wanted to move back home. His family opened up a garden center . 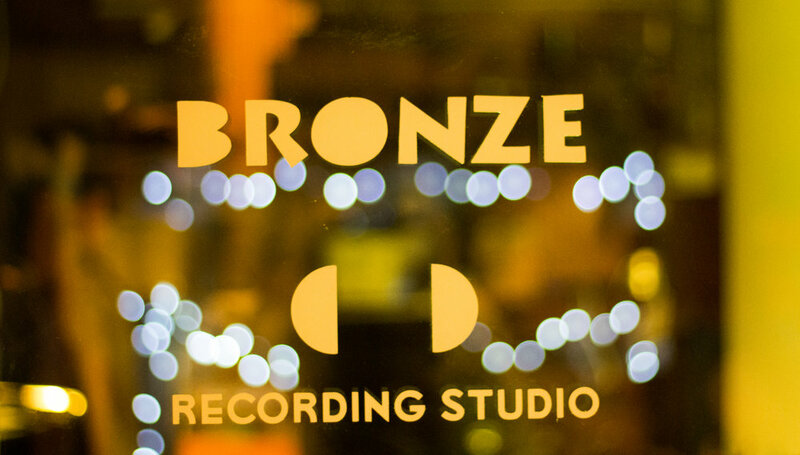 . . and he took some of the space and built a phenomenal recording studio [Bronze Studio]. He gets to keep his overhead really low, so we get very high quality recording at a very affordable price. Without Micah there, this project would never have happened at all. So I understand that you teach music. Has teaching music affected who you are in the studio? How do these things connect? I teach middle school choir at two different schools: Brighton Middle School and Munford Middle School . . . [teaching and the studio] both feed off each other very well. I feel like in choir you get to teach more of songwriting and how the music industry works, ’cause a lot of those things are very transferable over into what these kids want to do. So I get to use my studio knowledge to help feed these kids and talk about the music industry. Telling somebody what you know is a totally different story, so you definitely have to get your “educator hat” on sometimes when you’re talking in the studio. What do you want people to take away from Small Town Big Sound? Our big overall goal is just to create a name where people who want to succeed in the music industry can contact us and find a way to navigate it. There are plenty of people who make a decent living out of music, and I think more people need to know that if it’s something you want to do, as long as you have the tools necessary, you can make a solid career out of music. And that’s really all I want. I want to give them the tools necessary to make a career out of music. You can stream and purchase Small Town Big Sound’s music on Spotify, Apple Music, and Bandcamp. To learn more about the project, visit their website. Photography by Cynthia Sipes and Keegan Paluso.